The lifts at Meribel's La Chaudanne area are only seven minutes drive away. For most of the winter it is possible to ski back to Le Cruet along the Blue 'Villages' piste and also down through the fields to the telecabine in Les Allues. 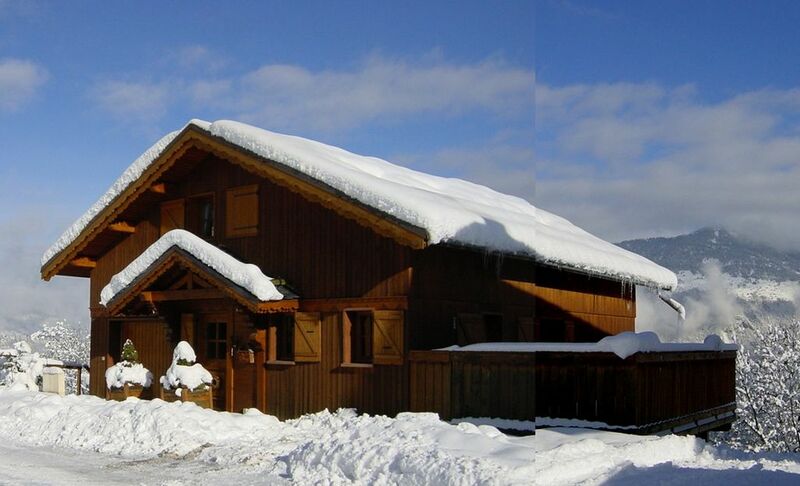 The Chalet is on the edge of the village with wonderful view over Les Allues and the Meribel Valley. There is a very good complimentary bus service from Le Cruet only two minutes walk from the Chalet. This is our family home and we hope guests enjoy it as much as we do. Family 2nd Home, we all love skiing and France in the Summer. great Skiing in the winter, nice local people. Summer is like going back in time, beautiful weather, views and plenty to do. There are three bathrooms in total, two ensuite, the master having a spa bath and laundry facilities, a washing machine and dryer. The spacious living area has an open fire, is welcoming and tastefully decorated with plenty of natural wood, warm fabrics and quirky pictures. There is a TV with UK cannels, WIFI, DVD, Video, music centre and plenty of games, books, videos and DVDs. The Kitchen is well equipped with cooker, hob, fridge freezer, microwave, coffee maker and dishwasher. Golf is Available in the summer at the 18 hole Meribel Golf Club. This Chalet is a real home from home. Well equipped with modern appliances, very comfortable and everything you could wish for or need when self catering. Loved the views across the valley and the piece de resistance being the open fire. Everything that we needed was at hand and everything worked. Although not ski in/ski out, popping our skis and boots in the car and driving to the Altiport in the morning was not a chore. Want to go for 2 weeks next year! My first thought when I stood in the chalet and then onto its balcony was WOW what an absolutely amazing view, halfway up a mountain, sun shinning and little villages nestling below us it was stunning. The chalet was roomy and beautifully appointed with plenty of room for the 5 of us. Each room has bed linin and towels supplied and the beds were really comfortable, no waiting for the bathroom to be free either with 2 ensuite rooms, 2 separate toilets and a shower room. The lounge area gave us plenty of room too to spread out and relax too, the children were especially happy with having WiFi and UK TV programmes. There was plenty to do in the area some beautiful walks and great cycling also some of the gondolers and chair lifts were open so you could get to the 'top of the world' without too much trouble. All in all we had a fabulous time staying in Chalet Tarine, booking was no problem and the owner Andy easy to communicate with, a great place for a summer holiday as well as winter. We enjoyed our holiday at La Tarine this summer! We made several hikes, the surroundings are beautiful (you can buy a book with hikes at the tourist office in Meribel). We also visited Annecy and its lake and the glacier La Grande Motte. The chalet was very complete, it was really cosy inside and the view from the livingroom and the balcony is fabulous! Highly recommended! We really enjoyed our time at La Tarine. It has a lovely view, a very nice kitchen / dining area, and a comfortable lounge area. We were 6 adults and 4 children, and felt the size was good. It definitely has the winter cozy feeling we were looking for. I was not sure when we booked the chalet how far Le Cruet was from Meribel Centre - Chaudanne and how practical it would be to have to drive around. It turned out that driving to la Chaudanne was very easy, and that we never had a problem finding a parking spot even during one of the busiest weeks of the year (half term in both Paris and London). Neither were the parking fees extortionate, at under 10 euros a day. We recently stayed at this Chalet for a week with friends & had the most fantastic time. The chalet itself has everything you could want - a real home from home but with the added bonus of spectacular views to the rear both day & night across the valley. Meribel centre is only a 7 minute drive away and Meribel Village is less than that. If you prefer to leave the car at the chalet there is a free bus service just at the end of the road. I would have no hesitation in recommending this chalet. In fact we were so impressed we are looking to return again this season. 2.5 hour drive from Geneva Airport, 1 Hour drive from Chambery, alternatively you can catch the train direct to Moutiers and its only 20 minutes up the mountain. Return to Meribel in the Summer and discover a different side to Meribel and the Vanoise National Park. Hiking levels reach up to 3855m and 500km of maintained and marked trails. The ridges of Tougnete, Saulire and Mount Vallon offer fantastic views over the Alps. There is some fantastic local villages to discover with breath tacking views and scenery along the way. The area provides the perfect environment for hiking, mountain biking, golf, climbing, parapenting, white water rafting, canyoning, horse-riding, tennis, paintballing, adventure play park in the trees, cycling, swimming, Ice skating, bowling, Cinema and lots of great restaurants.